Many people new to Adobe Photoshop and other Adobe Creative Suite programs feel like a deer in headlights. Sure, many of Photoshop’s tools will be completely new, and the software is, without question, complex. But, coming into your first projects, we can guarantee that you know at least two things: some items in the main toolbar and the goals of your project. With these things to build off of, we can help you make educated guesses where to look for the design-enhancing whatchamacallits and thingamajigs in Photoshop with good old-fashioned logic and imagery. Let’s start simple. 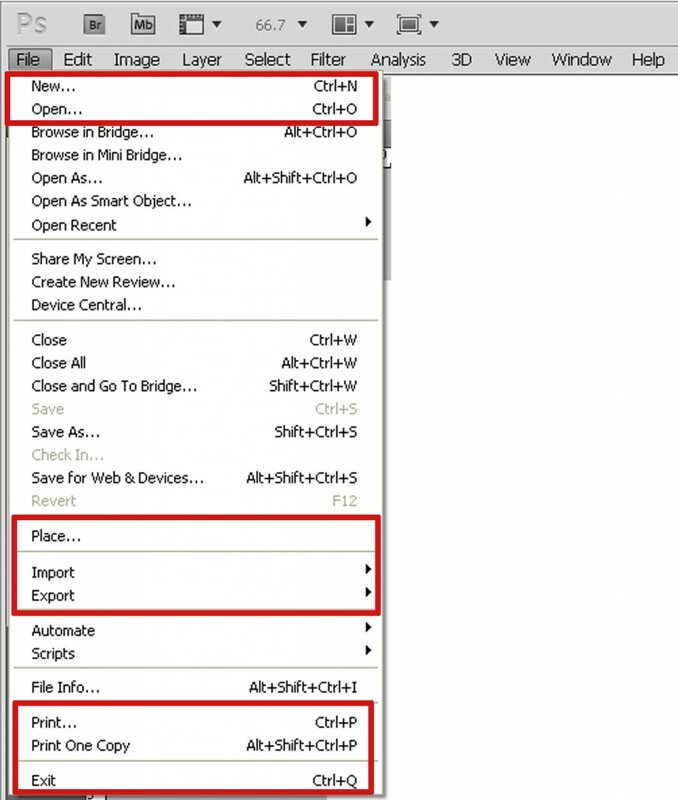 Looking at the Photoshop interface, you’ll notice the File and Edit menus in the main navigation. 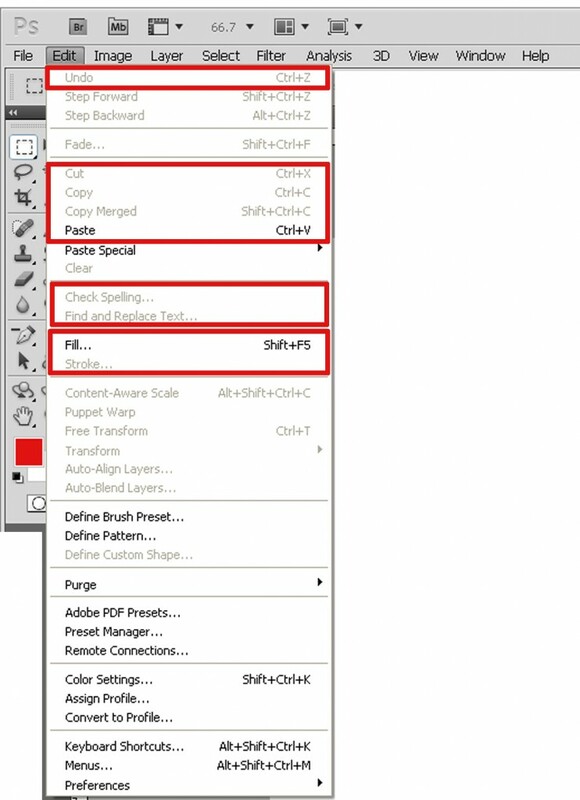 If you have ever used computer software before, then you should be familiar with this Adobe Photoshop Menu Bar. When should you look for tools in the File subhead? Well, what’s the definition of “file?” A file can be any document type. It can also be defined as a place to hold documents. So, whether you need to create a new document or move an existing document into Photoshop, File is the first and last place to look. Oh, you can also save here, but you already knew that, didn’t you? The Edit menu appears in many programs besides Photoshop, but it offers different tools depending on the software. Like other programs, tools that literally edit your document, like the Undo, Cut, Copy and Paste reside here. Simple enough. Other popular tools like Fill and Stroke are trickier animals, though. Unlike other effects that add elements to a layer, such as a shadow or highlight, Fill subtracts from a layer’s visibility. Like an editor with a red pen, it cuts down on visibility. Stroke fills selections with any color and thickness. So, imagine that editor’s pen again, but as a pen that can make a mark in any shape color and thickness, and you mastered Stroke. Making a selection is much like pointing at something. You’re essentially telling Photoshop, “Hey, check this out.” Photoshop responds by making your selection the objects you can change. The Select menu solely handles the magical dashed line of your selection. This menu holds useful tools like Deselect and Grow. For those frustrating moments when you can’t get rid of a selection box, the Deselect tool, well, deselects. Useful for creating borders around text or other objects, Grow makes a selection area bigger. Isn’t logic grand! If you’re really on your game, you’ll realize that you can use the Stroke tool in the aforementioned Edit menu to paint your selection. 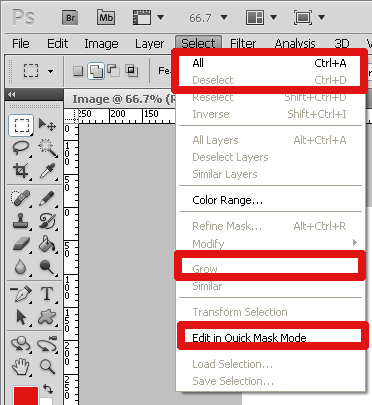 Though more of an intermediate or advanced function, Edit in Quick Mask Mode comes in handy when you want to create a specific, intricate selection. A good way to remember this is to think of a real mask. Wearing a mask hides your face. Well, this tool automatically makes everything “hidden” under a pink mask, and you can use a brush or pencil to reveal what you want selected. Having a plan will save you time and stress. For example, establishing how big of a document you need should be one of the first things on your check-off list. So, the Image menu might be one of the first places you visit when starting a project, as many of its tools alter the properties of your document on a macro level. For example, with Canvas Size you grow or shrink an entire document. 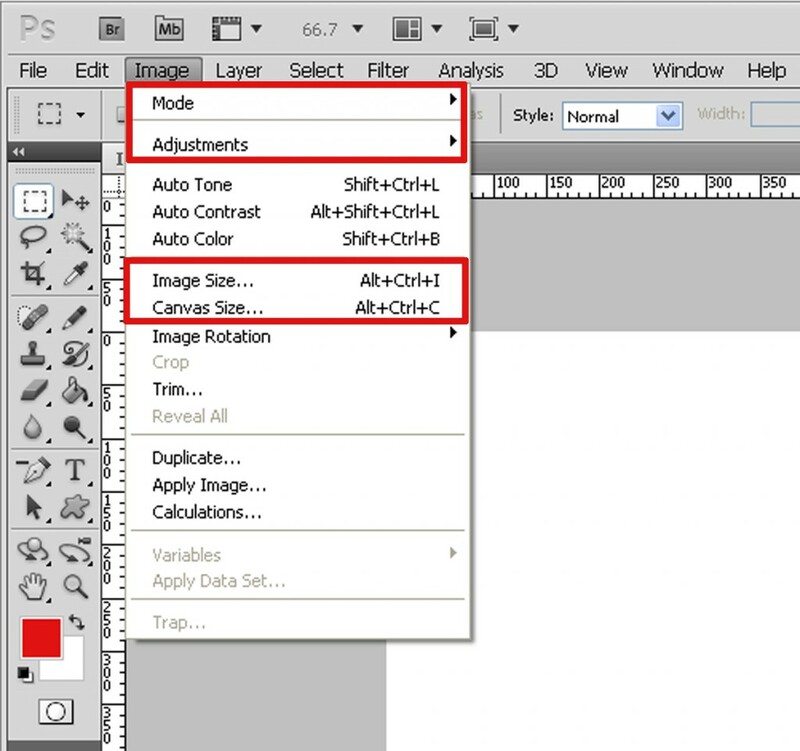 With Image Size you adjust the size of a graphic or photo on top of the canvas. The Mode submenu—which should only be used when you know exactly what you’re doing—converts the color mode of your design. Most projects should use multiple layers, and you can manage the tiers of your design in the Layer menu. Most people will use the Layer panel instead of this menu, but if you don’t recognize the icons in the panel, this menu will do the trick. The basic tools, New, Duplicate Layer, Delete, Merge Layers and Flatten Layers, all help piece together a design that won’t topple over like a tilted cake. Only two of these tools, Merge Layers and Flatten Layers, should give you trouble. In truth, the differences between these tools are so simple that it’s easier to bluntly describe them rather than offer imagery or logic. Merge Layers joins only layers you specify, while Flatten Layers squishes everything into a single layer. 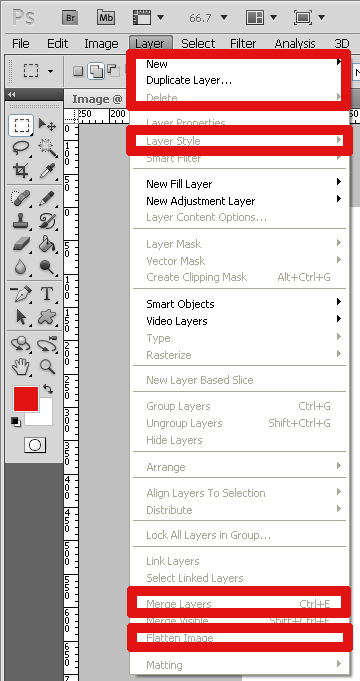 For a more detailed explanation on how layers work, read our past blog on layers. When you put something through a filter, it comes out with changed properties. For example, running water through a filter can remove chemicals, bacteria or other icky substances. Photoshop’s filters work in the opposite direction. They add an effect on top of what was previously visible. There are simply too many filters to run down in any one blog. 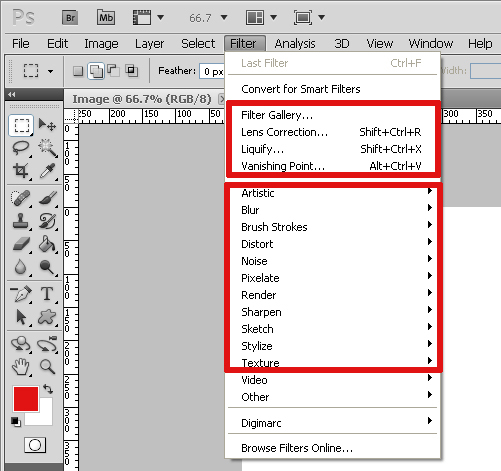 But, if you want to add a cool effect to your design, start by browsing through the Filter menu.